It is only coincidence that the quake in Nepal measured 7.8, the same magnitude as the scenario projected for Southern California’s so-called “big one” earthquake on the San Andreas fault. But this is not the only parallel seen by quake scientists. Near the top of the list is risk of water supply disruption, potentially for an extended period of time. “We are going to be doing what is happening in Nepal unless we deal with this issue,” said Dr. Lucy Jones, US Geological Survey Science Advisor for Risk Reduction. Nepal is vulnerable to quakes in the magnitude-8.0 range roughly every 75 years. In California, the historical and geologic record show the southern segment of the San Andreas fault gives away roughly ever 150 years. But it’s been 300 since the last one. The Los Angeles population center of Southern California is significantly farther from the San Andreas fault than is Kathmandu from the fault on which the Nepal quake occurred, essentially under the Kathmandu Valley. The San Andreas passes no closer than fifty miles from downtown Los Angeles. But accounting for topography and geology, mathematical modeling for the big one indicates that under some scenarios much of its energy will be funneled toward the Los Angeles basin. Jones dedicated the past year to the development of an earthquake resiliency plan for the city of Los Angeles. It focused on hardening infrastructure for water and communications, and increasing the safety of construction designs past quakes have shown to be vulnerable. It is a path that will require 20-30 years of building retrofitting and preparation for Southern California to be in a position to signicantly reduce the impact of a major quake. “Whenever it comes along, we will be grateful for what we have done, and regret what we have not done,” Jones said. Kit Miyamoto, chief executive of the California-based seismic engineering firm Miyamoto International, is traveling to Nepal to offer technical assistance and study the quake’s impact on structures, said Richard Chem, a structural engineer with Miyamoto’s Los Angeles office. 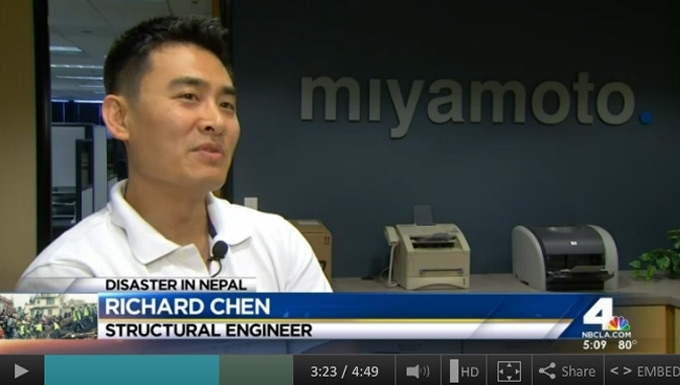 “Every time there is a major quake we learn more in the design profession,” Chen said. One significant construction difference is Kathmandu’s lack of high-rise skyscrapers, known for sophisticated seismic engineering. Be that as it may, computer modeling for the big one scenario projects five of LA’s skycrapers would collapse — but did not identify which specific ones. Kathmandu’s structures for the most part were built to lesser standards than in Southern California. However, past quakes have revealed the vulnerability of certain designs used in thousands of buildings. Modeling for the big one projects it would claim 1,800 lives — most inside buildings that collapsed. The 1933 Long Beach quake exposed the seismic weakness of un-reinforced brick buildings. All of the brick buildings have now been reinforced in Los Angeles, but some other cities have not required it. Also deemed vulnerable are concrete framed buildings with inadequate steel reinforcememnt, so-called non-ductile concrete, and structures with so-called “soft stories” prone to pancaking, as happened tragically at the Northridge Meadows apartment complex during the 1994 quake. consensus they need to be strengthened, the cost is proving a challenge. Another issue is the intent of the seismic building code to prevent loss of life, but not necessarily require the building remain habitable. Modeling for the big one projects that afterwards, 10 percent of the buildings will have to be red-tagged, and another 40% will warrant yellow tagging.